While his life was short lived in the thirteenth century, the legend of William Wallace continues to spark interest throughout the world. As a tribute to this legendary hero, we are proud to offer a replica weapon modeled from the sword he wielded in battle. Two-hand styling with a 23 1/2" stainless steel blade, featuring a leather covered grip stretching to the leather covered ricasso, originally designed for close quarter combat protection. 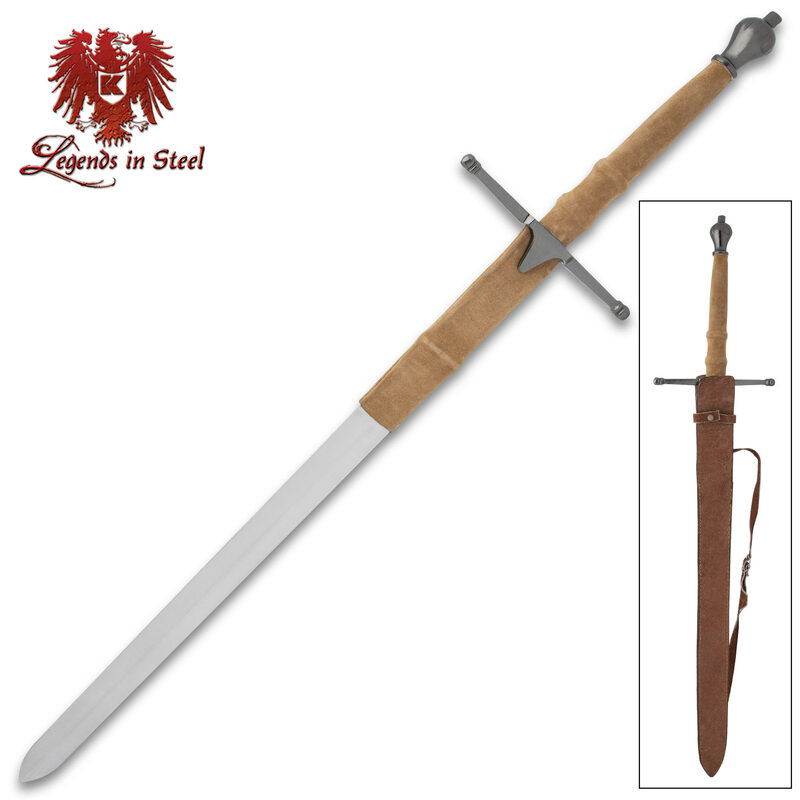 The cross hilt and pommel are constructed from stainless steel. 43 1/2" overall. Some of the reviews are complaining about poor craftsmanship but it is nothing more than a display item. This product is not at all worth the price, and I got it on a closeout sale. The sword is acceptable, but the sheath is well and plainly false advertisement. Not only does it not disclose that the sheath depicted is not in any way the same item you receive, but advertising a "Top quality leather scabbard" is an out and out lie. It is literally made of craft foam and cardboard with possibly the lowest quality leather I have seen on any product whatsoever as a simple facade on the outside. That is, if it is actually true leather, which is doubtful. The strap is the only thing I am fairly sure to be leather, but it is such low grade it would break were you to wear it for more than a few seconds under the weight of the sword. The final complaint is that my sword came with a defect in the coating on the pommel. While it was still in the box, before I had even touched it, the coating was flaking off. While I prefer the look of the metal beneath, which I have since further uncovered, it is still a defect in the product. I read the reviews, but had to see for myself. Personally, I like it. Straight blade and not too heavy to wield easily. A nice piece of history for my collection. I bought two of these in the BOGO sale, and will be returning them because I don't think that they're even worth $50 for both of them. All of the leather is suede, and discolored near the blade. The blade is not straight at all. The scabbard is pretty much useless, unless you plan to modify it. The strap is very thin and feels like it will break just supporting the weight of the sword. It is very hilt heavy, so when you try to wear it on your back it slides down. Pros. They do feel pretty good in your hand, and two of them crossed on the wall would look pretty awesome, if hung in a dark shadowy corner where you can't get too close to them. This one is OK. Nothing special about it. Lot of leather work on it. I was somewhat disappointed with the blade. Not as good a quality as I expected. The MacLoud sword is a better choice, and ten dollars cheaper. The pommel grip and crossguard are loose. the grip and crossguard are only held on by the pommel which has barley any threading! i swung the sword the grip fell apart and the blade went flying halfway across the room! i have seen this weakness (though not as severe) in two other $50 swords i bought here. unless you plan to reinforce the grip ( i recommend liquid nails and wooden wedges). it is legitimately dangerous to handle this sword. pros: point of balance is accurate, real leather. At first I was under the impresstion that the sword was not well made, Then after looking at it , I noticed it was a very well make sword. the strap could have been made better but overall, OUTSTANDING.